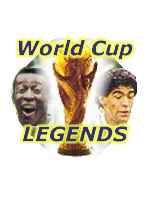 Nicknamed through-out his career as “Nacka” or the "The Waving Corncob", Lennart Skoglund was a star of two Swedish World Cup sides in the 1950s. First as a young inside-left in 1950 and then as a mature left winger on home soil in 1958. Born at Stockholm in 1929, blond-haired Skoglund was spotted as a 19-year-old playing for Third Division team Hammarby by the top Swedish club AIK Stockholm. A little over a year later, Nacka was making an impact in the World Cup held in Brazil where he formed a great partnership with Karl-Erik Palmér as Sweden finished third. Skoglund moved to Italy to play for Inter Milan after the World Cup and had huge success helping them win the Serie A title twice. His fine ball-control, excellent left foot and fine distribution made him a big favourite with the fans. 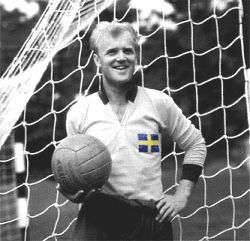 Sweden failed to qualify to the 1954 World Cup because they would not recall exiles like Nacka, hence his few caps, but when the Swedes played host to the 1958 tournament, they had a change of heart and Skoglund appeared in all Sweden’s games as they finished runners-up to Brazil. In the semifinal against West Germany, Nacka scored his first and only goal for Sweden in the 3-1 win which set them up for the classic final against Brazil. He left Inter Milan after nine great seasons in 1959 to play for Sampdoria and Palermo before returning home to Sweden in 1964 for a second spell with his native club Hammarby. He won promotion to the Swedish top division in his first season and retired a couple of years later.